The #1 New York Times bestselling graphic novel inspired by Peter Schweizer's bestselling exposé, which the New York Times called "the most anticipated and feared book of a presidential cycle." 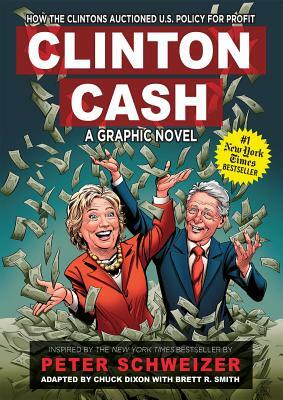 Based on the New York Times bestseller Clinton Cash by Peter Schweizer, this graphic novel retells in high-definition detail the tale of the Clintons' jaw-dropping auctioning of American power to foreign companies and Clinton Foundation donors. Peter Schweizer is the author of multiple New York Times bestselling books, including Clinton Cash, and a senior editor-at-large at Breitbart News Network. His reporting has been the basis for 60 Minutes segments as well as numerous articles in The New York Times, Washington Post, Wall Street Journal, and elsewhere. Chuck Dixon is a comic book writer best known for his long runs on several Batman titles in the 1990 s for DC Comics. Throughout his prolific career, Dixon has written for" Evangeline" (Comico Comics), "The Savage Sword of Conan, The Punisher War Journal" (Marvel Comics), "Robin, Nightwing, Detective Comics" (DC Comics), and "Simpsons Comics" (Bongo Comics). Dixon worked closely with Robert Jordan on the graphic adaptation of "New Spring" and with Jordan s estate on The "Eye of the World" graphic novel. Brett R. Smith is a professional commercial artist working in the comic book industry as a color artist, a storyboard artist in the advertising industry, and a graphic artist for multiple clients. He holds a B.F.A. in Animation. Smith started in the commercial art field in 1995 as an in-house color artist for Chaos! Comics. Since then he has worked with a wide array of clients, including Marvel and DC Entertainment, Hasbro, Cartoon Network, McCann Erikson, BBDO, and Saatchi & Saatchi. Smith has contributed to multiple premier properties and licenses including, The Avengers, Batman, Superman, GI Joe, Wolverine, Guardians of the Galaxy, Hulk, Detective Comics, Heineken, Chase, Cheerios, Pillsbury, Birds Eye and many others.